There is a lot of information coming out about the OUSD budget. Here is a quick update with (1) Board of Education’s midyear adjustment resolution from last week; (2) my East Bay Times op-ed on moving forward; and (3) a look at the “Post-Mortem” from the 2016-17 budget issues. While the mid-year cuts are going to be incredibly painful, it will be much worse if OUSD ends up in state receivership. If the state has to come back to OUSD, they will be absolutely brutal in pursuing financial stability. That means lots of school closures and less programming without community input. Later this week I will share information about a few other key, but often misunderstood, issues that are important for understanding Oakland’s budget issues (state receivership, reserve, and Self-Insurance). OUSD has a mountain of work and little room for error in the coming weeks and months. They are going to need support to make it. 1). Board Resolution: Last week the Board of Education approved a resolution directing the Superintendent to make $15.1 million in midyear adjustments for the current year in order to stay financially stable. On November 27th, the Board will vote on the actual programmatic changes that need to be made to address the budget issues and avoid state receivership. According to the latest projections, $9.5 million will come from the Central Office and $5.6 million will be from site budgets (school sites will be given some flexibility for how to make the cuts). November 20 – Parent/student informal engagement on 17-18 budget adjustments, co-hosted by Directors Eng, London, and Gonzales at MetWest High School. November 27 – Special BOE Meeting – Superintendent presents plan to address 17-18 mid-year reductions. 2). East Bay Times Op-ed: I wrote an op-ed for the East Bay Times about OUSD’s current financial issues that was published today. The key takeaway is our belief that strong leadership and community engagement are critical in righting the ship. 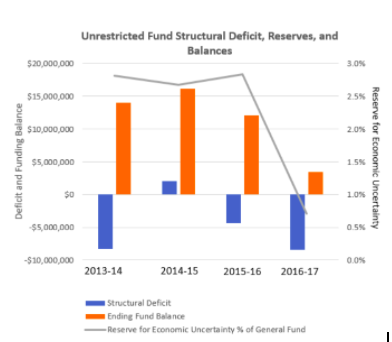 The first tracks deficit spending and the drop in the reserve over the past few years. It shows that OUSD overspending and the impact on the ending fund balance (savings account). It drops steeply in the past two years. The post-mortem report has more information about why this happened. 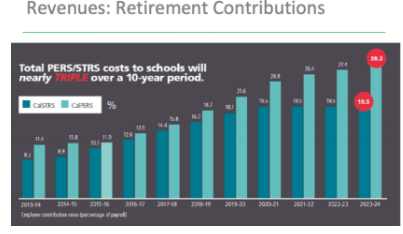 This slide looks at the coming increases in the STRS and PERS contribution in recent and coming years. This is a huge issue for OUSD (and statewide) especially since school funding is projected to stay flat. It means that OUSD will have to spend more if its funding on pensions contributions which means less on education programming. 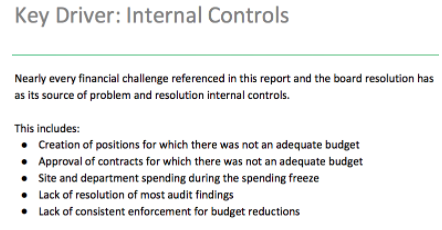 This slide, from the Post-Mortem report, highlights the role that lack of internal fiscal controls played in the current budget issues.